New Orleans Pelicans' Austin Rivers reacts to a foul called against New Orleans during the second half of an NBA basketball game against the Golden State Warriors, Tuesday, Dec. 17, 2013, in Oakland, Calif.
Maybe it was Andre Iguodala’s presence in the starting lineup. Maybe it was coach Mark Jackson publicly challenging his players. Or maybe it was simply facing an undermanned opponent at home. Whatever the reason, the Golden State Warriors finally started to look like the team that started off so strong this season. Stephen Curry had 28 points and 12 assists, David Lee added 21 points and 17 rebounds and the Warriors beat the short-handed New Orleans Pelicans 104-93 on Tuesday night in Iguodala’s long-awaited return. "He’s a guy that makes life so much easier for everybody on the floor," Jackson said. "His ability to make plays, his ability to read and react, we missed him. Glad to have him back. And then there was a carryover effect." Iguodala finished with two points and two assists in 17 minutes after missing the previous 12 games with a left hamstring injury. The Warriors led by 10 points in the first quarter, 18 at halftime and 26 late in the third quarter. Golden State, which is 9-2 with its regular starters in the lineup, never trailed. "I felt good. I got tired of watching," said Iguodala, who was 1-for-4 shooting. "You get a new appreciation for the game, especially seeing your brothers struggle. I thought it was a great game by everyone." The Warriors outshot the Pelicans 45.1 to 37.5 percent and outrebounded them 58 to 44 to control the game — for the most part — from start to finish. New Orleans made a brief run in the fourth quarter against Golden State’s backups before the starters returned and restored order. 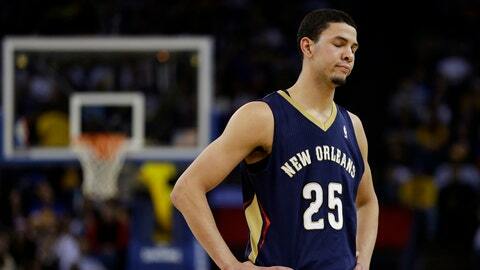 The Pelicans played without injured starters Anthony Davis (broken left hand) and Tyreke Evans (sprained left ankle). Ryan Anderson had 21 points and six rebounds and Jason Smith scored 12 for New Orleans, which has lost its first two games of a five-game trip. "Just a bad game from the start," Pelicans coach Monty Williams said. The Warriors went 5-7 after Iguodala injured his hamstring Nov. 22, losing three of their last four games. They had especially struggled on defense, though the problems extended beyond Iguodala’s absence. Jackson even called out his players for a lack of effort after a loss at Phoenix on Sunday, saying "I am finding that the guys in the suit and tie want it more than the guys in uniform." After a string of slow starts during its recent slide, Golden State opened the game against New Orleans with the kind of heart and hustle Jackson has wanted from his team. The Warriors dominated at both ends of the floor in a near-flawless first quarter. About the only blemish in the period came when Harrison Barnes suffered a left eye lid abrasion and was poked in the eye inadvertently by Lou Amundson going for a rebound. He returned a few minutes later. The Pelicans played mostly on the perimeter and got nothing going offensively. The misses gave the Warriors several fast-break opportunities, and they took advantage of them throughout. Iguodala punctuated the fast start when he finished an alley-oop from Curry late in the second quarter for his only basket, sending most of the announced sellout crowd of 19,596 roaring to its feet. Two possessions later, Curry followed with a layup through traffic to give Golden State a 57-39 lead at the half. "Just a tough game. Another one of those that they just had a little bit more energy than us," Anderson said. The Warriors went ahead by 26 points late in the third quarter, and Iguodala nearly pulled off one of the highlights of the season during the run: He dribbled to his right, faked a behind-the-back pass, bounced the ball through the legs, then cuffed it with his right hand and tried to dunk over Smith — but missed off the back iron. Klay Thompson scored 16 points and Andrew Bogut added eight points and 10 rebounds for the Warriors. The only rally New Orleans put together came against the bottom of the Warriors’ bench. The Pelicans sliced Golden State’s lead to 93-80 with 6:02 remaining before Jackson put all of his starters except Iguodala back in to regain control. "This team was challenged by our coach," Lee said, "and we knew this we as a game we needed to have." NOTES: Golden State has won six straight against New Orleans. … Curry has scored 20 points or more in a career-best 11 straight games. … New Orleans is 3-4 since Davis broke his hand Dec. 1.